Sorry that this recap took so long! University has started again for me, and I also delayed this due to the very sad news regarding HJW's father. We begin the episode with Jiwon at the press conference for the show. "The one that I became the closest with, a bit like a love relationship. 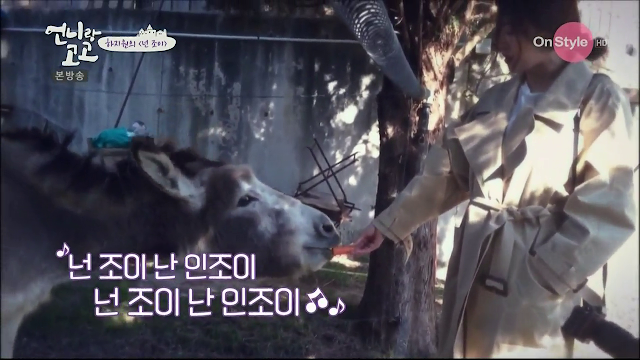 It's a donkey whose name is Zoe." LOL. Of course. For the Zoe Song, Heecheol of ZE:A did a featuring. We see him at the recording studio and he says he's a big fan of Jiwon and it's an honour to do the rap in her song. 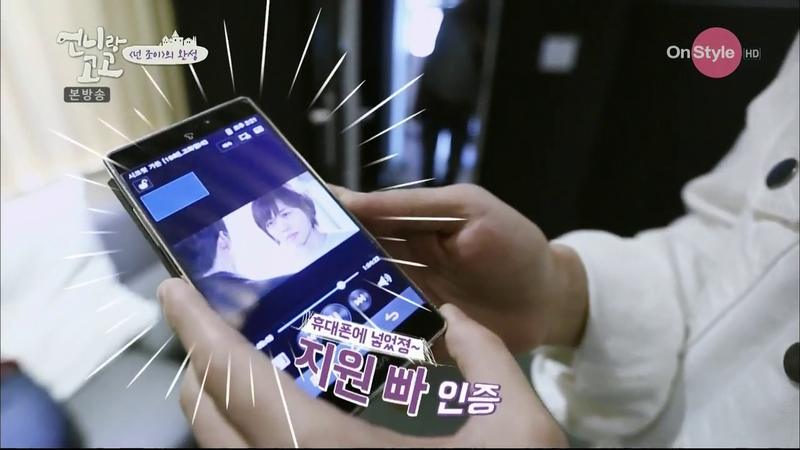 Till now, he's still watching Secret Garden, and he even shows proof by showing the video of it that he has on his phone. The music producer shows him a video of Jiwon doing her recording, and Heecheol says that he's burdened haha. "The song is like a cute song in a fairy tale, I have to do it cutely. But I can't do cute very well!" Still, he does well during his recording. We move back to Grasse where the sisters having lunch. Jiwon is super pleased. "I like this kind of food. My style!" Yookyung keeps staring at Jiwon so Jiwon asks why. In the interview, Jiwon says "Once I go to Korea, I have to go for drama filming immediately. To me, this time is really like treasure." There's a montage of some of the times she's spent here, such as her playing with the little boy, cooking, arguing about the coffee press with her sister etc. "Because I really like this place, without me knowing, I managed to relax and unwind a lot." We cut back to them having lunch, and Jiwon says that today, it's really like their neighbourhood and not unfamiliar anymore. "Although there are people who are shy and don't speak, I say everything. But because I have such an age gap with unni, we have never talked like friends. But at the barbecue party, we sang together while drinking wine, it was the first time I felt like friends with unni. I really liked it. Although we think we're always comfortable as we're real sisters, it was even more comfortable as friends. I liked it the best." In the interview, Yookyung: While we were together, because we were honest to each other, I really liked everything. And I received many presents from my sister. For coming together and being together, I really wanted to say thank you once. So she prepared a gift for Jiwon! It's a refresh oil and Jiwon loves it! 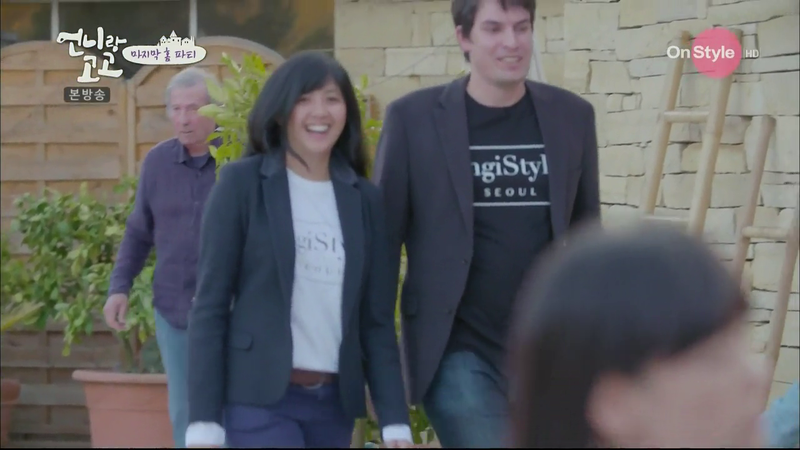 Jiwon: "A city where I felt that I really want to live in...I think Grasse is the first." Now we're back to the last night when they were preparing a home party. It's 5 minutes to 6:30pm when the guests are supposed to arrive, and she's not done preparing and hasn't changed. She takes out a bottle of wine, and asks the cameraman if she should just use that. And the cameraman is like ??? why are you asking me hahaha. She runs out then in again, shouting to Yookyung that she's going to change and for now, that is done so here is fine. The captions are like what is 'that' and 'here'? Hahaha. So she goes to change and wahhhh so pretty!! They head out to wait for their guests. First to arrive are John and Dominique (well, since they live in the same compound haha.) 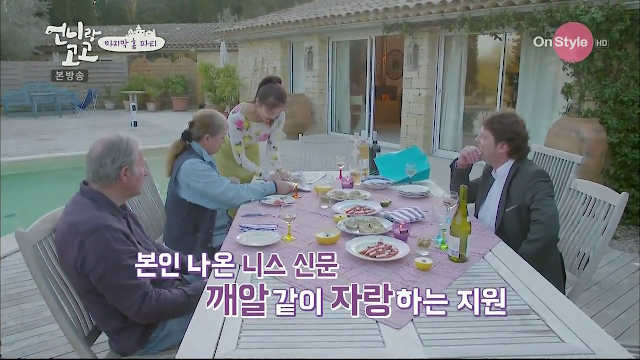 They give her a bottle of wine because it's tradition in France to give something when they are invited. 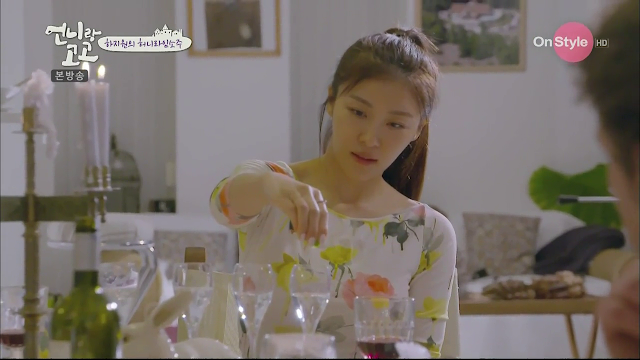 Jiwon pours some wine for them and they start talking. "I fall in love in Grasse!" The next guest is Franck, who was her aide in France. He also gives a bottle of wine! I'm sure the alcoholic in Jiwon is delighted haha. She then starts telling them about getting asked for her autograph at the supermarket and appearing in the newspapers. Her excitement about being recognised is so adorable! "It's me." LOLL. While they are discussing what the sisters have prepared, Yookyung is cooking the bulgogi and tomato soup inside. When Yookyung comes out, Jiwon goes in to try the soup. "It's quite spicy. How??" I think Koreans generally have a high tolerance for spicy food, so if she says it's spicy, it must be very spicy! And then she coughs from the spiciness. "Oh spicy! Even I find it spicy. This is terrible." She decides to cut some bread so they can dip it in the soup. But it's insufficient! Then she asks the crew to help her cut the baguette and happily walks out. Hahahaha. Because one host needs to be outside to entertain the guests. So this poor PD had to help her cut the baguette. Dominique decides to take a photo while Yookyung is still cooking, so Jiwon starts calling out "Unnie!!!" Then Dominique starts to follow and call "Unnie!!" also hahaha. Jiwon is like "Wow your pronunciation is good!" then starts cracking up lol! The final guests arrive, and they're Dominique's son, Jonathan and his wife, Patricia. Omg so cute they're wearing t-shirts that have Seoul on it! Patricia even greets Jiwon with an "Annyeonghaseyo." Turns out Jonathan can speak Japanese so Jiwon busts out the only Japanese she knows. "Nice to meet you. Please take care of me. I am Ha Jiwon." They move inside to have dinner. Jiwon tests the soup again and she nearly chokes again from the spiciness! They actually allocated places for each person so Jiwon shows each of them to their seat but Patricia accidentally sits on the wrong place and Jiwon is so flustered hahaha. Luckily, Patricia quickly notices and moves to her seat. Jiwon and Yookyung continue being busy preparing the food. They decide to add some cheese to reduce the spiciness of the soup. Meanwhile, Dominique is going around taking pictures. So cool she was a reporter-photographer! They finally serve the food. Jiwon: "This is tomato soup.....little spicy. Korean style." Hahaha I'm quite sure it's very spicy considering how she was choking. The captions label the sisters as criminal 1 and criminal 2 LOLLL. When Dominique says they like spicy food, Jiwon practically sighs in relief and starts bowing HAHA. But they don't start eating. Then Dominique gets up to get a spoon and fork for Jonathan and Jiwon is like "Don't have????" She goes to check and is super embarrassed hahaha. She ends up giving her own set to him. 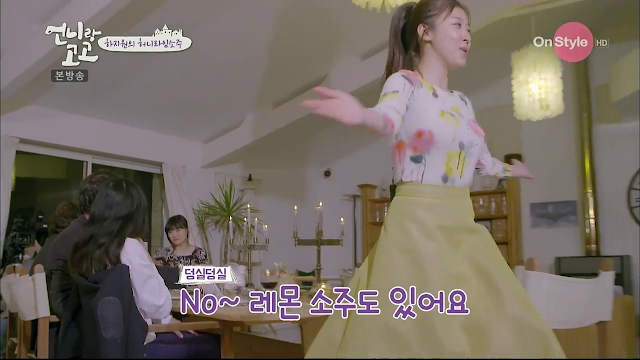 Jiwon tells Yookyung to go and pour wine for the guests, but Jonathan ends up doing it. In the kitchen, Jiwon is nearly having a mental breakdown trying to look for the correct cutlery to serve the bulgogi. She asks them to eat but no one is starting because Franck doesn't have a fork. Nobody really wants to say anything so Dominique tells her Franck doesn't have a fork, and she's like ???? And then Patricia lifts up her fork and Jiwon finally gets it and gives her own fork again. Then 2 seconds later, the lights go off. Oh my, what an incident-filled home party. But Jiwon starts cheering and goes "Wow! I love it!" HAHAHA. In the interview, Jiwon says that the guests had a hard time because of her. And the caption says she's in deep reflection lolll. In the dark, the sisters realise they didn't put napkins. Jiwon: I must be stupid. It's all my fault. They start eating in the dark and throughout the dinner, Jiwon just keeps asking if the soup is spicy. They all say no and it's fine but Jonathan keeps coughing lol. I think everyone finds it spicy but they're holding it in well but Jonathan has the physical signs haha. At least Jiwon realises this. Yookyung asks if they should give more soup. Jiwon: "They're all very kind. Even though it's spicy, they're eating it all." Dominique wants more so Jiwon goes into the kitchen to get more and she's like "It seems like Dominique ahjumma can eat this better than me." And she also prepares more food. "I think I need to prepare more food. I forgot to buy the seafood onion pancake. The food seems insufficient and they'll be hungry. I think they have to eat again at home." LOL. She says it's the first time she's doing this home party (alone, without the help of her mother, I assume) and she think she can do a better job next time. At the dinner table, Patricia asks what does Jiwon not like about Grasse. Jiwon: Why? Come on! I love French! I love France! I love here! It's true!! Hahaha her enthusiasm is so endearing. Jiwon: So beautiful! Bread, fruit, cheese, people....everything I love it! Especially my favourite is...........mornings"
Wah I nearly thought she was going to say donkey. They're about to finish eating and Patricia comments that they didn't have soju. Jiwon the alcoholic practically lights up and skips to get the soju to start making her honey lemon soju. Hahahaha Patricia comments that she's a professional and Jiwon is like "YES. This is really important." The response to her lemon soju is super positive and she's soooo happy. "The cocktail I made seems to be French style. Don't you think it can spread (to other countries?)" Then she starts giggling in happiness hahaha. "I must be drunk." Jiwon then shows the drawing that Yookyung and her did of their accommodation at home. Of course, being Jiwon, she opened the artwork and it was upside down hahaha. Jiwon: "What I was touched by was that all the guests were so warm, gentle and the considerate heart they had. I should have prepared more. It's a little bit of a pity." It's almost the end of their home party, and Dominique asks Jiwon to go back safely and come back quickly. In the interviews, Patricia says that Jiwon was very kind and it was fun. Even though Jiwon is a top star, she made people comfortable. She thanks them for the invite and that it was an honour eating the food cooked by Jiwon. Jonathan says that the food was delicious. He also thanks them for playing along with his playful jokes and that it will be nice to meet again. Dominique recounts the first time they met at the huge gate with all the animals, and says that she was absolutely beautiful. She's touched that they liked the house so much. When asked what kind of person Jiwon is, Dominique answers that she's always smiling, enthusiastic towards people and has a beautiful personality, and that she was really happy to meet Jiwon. She also says thank you for choosing their house. In the interview, Jiwon: "Really, it was an indescribable time here. Dominique ahjumma, John ahjussi, Zoe, Nita....I don't think I can forget our family here." "Everyone here was very friendly and warm to me so I was really happy." "Living here in Grasse was, to me, a turning point and a chance for me to mature." 3h before they are to leave France, she visits Zoe to feed him for the last time. She comments that his eyes look sad and ears are down. "You're Zoe. I enjoy. But today, I'm not enjoying. The next time I see you, you'll be really big." The staff shout that they have to go so she finally leaves. They finally reveal the full Zoe Song, and it is played over a montage of their times in Grasse. Lastly, we end with a mail from Dominique to Jiwon thanking them for everything. Aww so sweet! A space to share my travel experiences, all aspects of korean entertainment and occasional snippets of life.